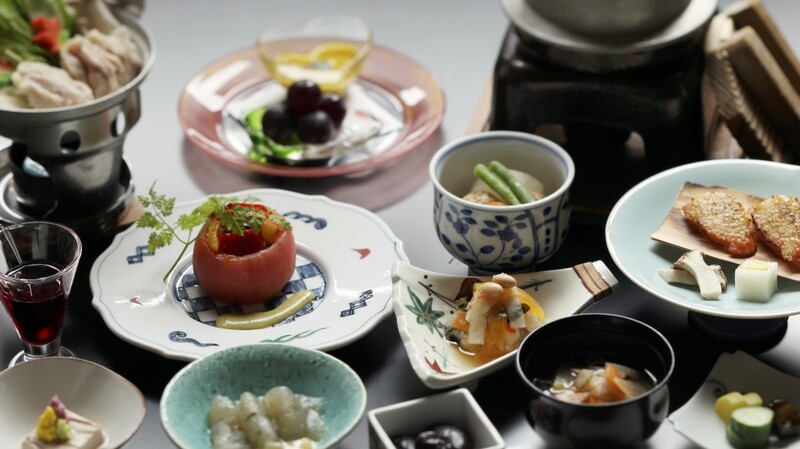 As I previously wrote, most ryokan, especially local ryokan, serve as “one night with two meals.” In other words, meal and accommodation are provided as one set, and meals are usually Washoku. We, at Shima Onsen Kashiwaya Ryokan also serve dinner as Washoku course cuisine and serve about 10 dishes starting from aperitif. You can choose breakfast from Washoku, Western style, or branch at Kashiwaya cafe located at onsen town. Japan, surrounded by the sea, is a treasure trove of delicious seafood. In addition, there are many delicious freshwater fish unique in Japan, such as Ayu (sweet fish) and char. 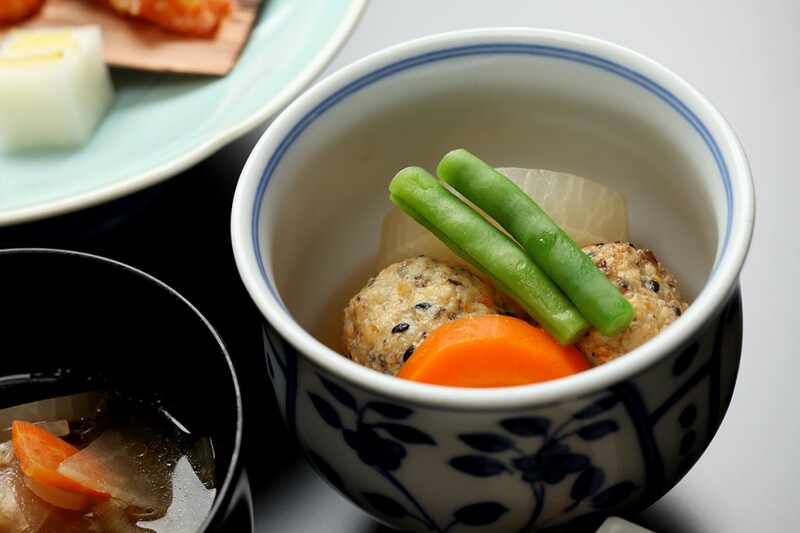 Maybe for this reason, most Washoku served at ryokan is a well balanced dish with a combination of vegetables, fish, and meat. Dashi (soup) is also one of the cultures that Japanese Washoku boasts. Among them, Katsuo Dashi is the basic of Washoku and contains rich “Umami (taste).” Katsuo Dashi has been used in many dishes offered in Washoku course meal. Katsuobushi (dried bonito), the origin of Katsuo Dashi, is said to be the hardest food ingredient in the world. It is a food ingredient like an art made with lots of process, time, and intelligence, such as stewing bonito caught in the Pacific Ocean, fumigating, drying, molding, and so on. We, Shima Onsen Kashiwaya Ryokan , are currently happily inviting customers around the world. Due to a variety of circumstances of customers, many customers request meals of mainly vegetables without meat and fish. So we are contriving to meet customers’ requests as much as possible. We may not be able to always respond to all requests due to congestion situation of the day, and so on. But first, please feel free to contact us. For people who cannot eat meat, we correspond with vegetables and fish. In this case, we can always correspond almost 100%. Also, for vegetarians who cannot eat neither meat nor fish, we try to correspond as much as possible. But please understand we might ask additional fee as we require extra time (process) for cooking. To say vegetarians in a bundle, each person has different food to be eatable. Thus, we appreciate it very much if you could tell us the details beforehand with e-mails and so on. Especially eggs, dairy products, and Dashi (soup) are unique to every customer. Among them, it is very important for us whether we may use Dashi (soup) extracted from bonito (or seafood). As I wrote earlier, because Katsuo Dashi (bonito soup) is the very basic in Japanese food, we have to make other soups and cook meals completely separately with other customers, if we cannot use Katsuo Dashi (bonito soup). In this case, we mainly use Shojin Dashi (vegetarian soup, extracted from plants, such as kelp and shiitake) and soups extracted from flavoring vegetables. It should be noted that, unfortunately, we cannot serve meals corresponding to Halal right now. Please acknowledge it beforehand. Meal is one of the great pleasures of overseas travel, isn’t it? First of all, please do not hesitate to contact us if you have any questions and requests.